Come experience Sedona like you have never before. Whether you have been here many times or this is your first visit, Jim Reich and his team of guides at Sedona Red Rock Adventures will share with you not only the inherent and majestic beauty that only Sedona’s red rock’s offer; but the passion we have in our hearts, our being, our very existence. It’s our connection to the land that is evident in every tour. This is why we do what we do, and why we share it so well. On our Scenic Sedona Connection you will learn about the history of the area, ranging from recent history to the days of Cowboys & Indians. We will share you various and interesting points of interest throughout town, tell you about the local wildlife, plant species, geology and natural history, and share you more rock formations than you ever knew existed. 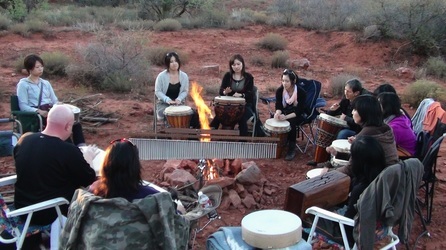 After exploring the beauty of the red rocks, your tour takes you to an incredible Fire Ceremony, where you get to connect with the land through the power of fire. Here your fire guides will lead you through a sacred ceremony connecting you with all the elements of Planet Earth – Fire, Sky, Water, & Earth. This is a remarkable tour, one that we have never brought to the public until now. If you are wishing to not only to experience the majestic beauty of the land, but also to get in touch to yourself through this incredible and heart centering fire ceremony, this tour is for you. There are many ways to see Sedona, but experiencing it on a tour with us is like no other you have experienced. Our Scenic Sedona Connection is a 5 hour tour.